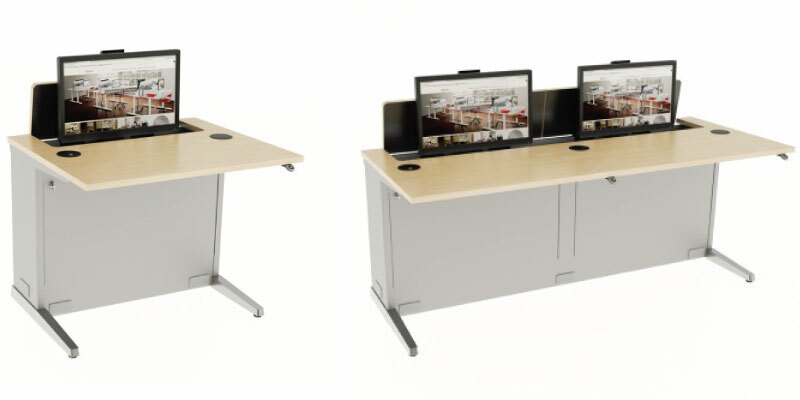 Activate a regular classroom into a training dispatch room in just seconds with the electric-powered Fusion Trio Desk. Simply press a button at the desk or by remote and watch the computer monitors disappear below the work surface to create a standard desk with plenty of work area. The instructor and students now have a clear line of sight to communicate effectively, which enhances learning. Selection of modular work surface designs. T-Bar Supports up to three 19” LCD monitors. Height adjustable work surfaces. 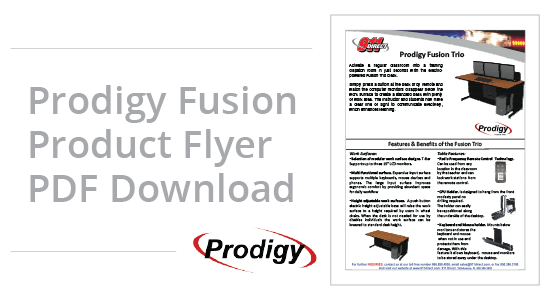 A push-button electric height adjustable base will raise the work surface to a height required by users in wheel chairs. When the desk is not needed for use by disables individuals the work surface can be lowered to standard desk height. Radio Frequency Remote Control Technology. Can be used from any location in the classroom by the teacher and can lock work stations from the remote control. CPU Holder. Is designed to hang from the front modesty panel no drilling required. The holder can easily be repositioned along the underside of the desktop. Keyboard and Mouse holder. Mounts below monitors and stores the keyboard and mouse when not in use and protects them from damage. With this feature it allows keyboard, mouse and monitors to be stored-away under the desktop.